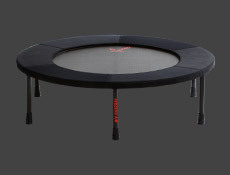 Rebound Air Creates the Best Mini Trampoline exercises in the World! We know that exercise is important. We’ve been told since we were little that we should be exercising almost every day. When it comes down to it though, there are a lot of reasons why a person doesn’t exercise, let alone step into a gym. Let’s face it, the nine to five work schedule can really make it hard to let exercise be your top priority. On top of that, you have other responsibilities that are downright exhausting. What is the remedy? Do people really have time to get up, get dressed, spend a bunch of time in the gym, then shower up and get ready for the day? This is where the Rebounder Workout comes in to save the day. One of the best ways to have the time to exercise is to workout at your own home. The Rebounder Trampoline Exercises not only will save you time, but it is the all-around workout that you need in order to tone up, strengthen your limbs and core, as well as help you to enjoy the benefits of living a healthy life. You don’t need to have weights, you don’t need a treadmill, and you don’t need a lot of time in order to get into the best shape of your life. One of the biggest health benefits to exercising on the Rebounder is that it is safe and easy on your joints. You don’t have to worry about the constant pounding on your knees from the treadmill or pavement. You will also build strength from the upper body exercises, as well as durability and endurance from the cardio workouts. 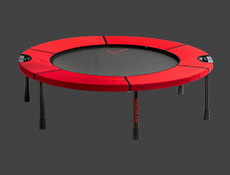 The rebounder is much, much more than a small exercise trampoline; it’s a complete body workout machine. Don’t have room in your house or apartment for something like this? Think again, the Rebounder is completely portable through its folding capabilities. It can be stored away with ease into its bag, as well as travel with you on those long business trips and vacations. No matter what your living conditions are or lifestyle, the rebounder workouts will help strengthen, tone and shape your body. 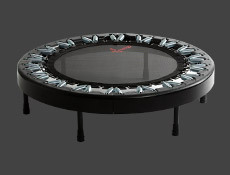 The health benefits you will experience through using the Rebounder will also shape your life. As you get into the routine of Rebounding, you will feel yourself having more energy, you will also look and feel better as you begin to tone up and get into shape. The confidence that comes from being in shape and being self-disciplined will also be of benefit in your day-to-day routine. You’ll find yourself more focused at work, and having more of a drive and desire to be proactive and achieve your goals. There are so many benefits with rebounder trampoline exercises, and we encourage you to change your life today by beginning to use it. You will feel the difference!